Note: This pattern can be worked to any size, but be aware that it will grow considerably with blocking. Row 1: Ch 4. In 4th ch from hook make 8 dc; turn. Row 2: Ch 4, *dc in next st, ch 1. * Work * to * 7 times, dc in last stitch. (9dc, 8 ch-1 spaces) Turn. Row 3: Ch 5, *dc in next st, ch 2. * Work * to * 7 times, dc in last stitch, turn. Row 4: Ch 4, *dc in ch-2 space, ch1, dc in next st, ch 1. * Work * to * until the last ch-2 space. Then dc in ch-2 sp, ch1, dc in last stitch. (17 dc, 16 ch-1 spaces) Turn. Row 5: Ch 5, *dc in next stitch, ch 2. * Work * to * until the last stitch; dc in last st. Turn. Row 6: Ch 5, dc in same stitch. V-st in every remaining dc of previous row, turn. Row 7: Slip stitch into ch-2 space, ch 3, work 6 dc into same space. *Sc into next ch-2 space, make 7 dc in next ch-2 space. * Work * to * across row. (9 fans) Turn. Row 8: Ch 5, dc in same stitch. *Ch 2, sc in center dc of previous row’s fan, ch 2, V-st into sc of previous row. * Work * to * across row and work V-st into last stitch of the previous row’s fan. (10 V-sts) Turn. Row 9: Sl st into ch-2 space, ch 3, work 6 dc into same space. *Ch 2, sc in sc of previous row, ch 2, and work 7 dc into next ch-2 space. * Repeat * to * until the end of the row. (10 fans) Turn. Row 10: Ch 5, dc in same st. *Ch 2, sc in center dc of previous row’s fan, ch 2, V-st into sc of previous row. * Work * to * 4 times. (This will put you at the fifth fan.) Ch 2, V-st, ch 2, dc into same stitch (between the fifth and sixth fan). Work * to * until end and work V-st into last stitch of the previous row’s fan. Turn. Row 11: Sl st into ch-2 space, ch 3, work 6 dc into same space. *Ch 2, sc in sc of previous row, ch 2, work 7 dc into next ch-2 space. * Repeat * to * until last sc before the center V-sts. Ch 2, 7 dc into each ch-2 sp of the center V-sts. Work * to * until the end of the row; turn. Row 12: Ch 5, dc in same st. *Ch 2, sc in center dc of previous row’s fan, ch 2, V-st into sc of previous row. * Work * to * center, sc in 4th dc of previous row’s fan, ch2. (V-st, ch 2, dc in same space) between the center dc’s on center fans. *Ch 2, sc in center dc of previous row’s fan, ch 2, V-st into sc of previous row. * Work * to * until end, and work V-st into last stitch of the previous row’s fan. Turn. Continue repeating Rows 11 and 12 until shawl reaches desired size, then continue to Edging. The last two rows will build upon the last row of fans to make a nice, simple, scalloped edging. Row 1: Ch 4, (dc, ch 1) in next 6 sts, dc in sc of previous row, ch 1. *(Dc, ch 1) in next 7 sts, dc in sc of previous row, ch 1. * Work * to * until you reach the center fans. Work (dc, ch 1) 14 times; dc in sc of previous row, ch 1. Work * to * until end of the row, ending with (dc, ch 1) in first 6 sts of last fan. Dc in last st; turn. Row 2: Ch 2, hdc into each space and stitch for the next 12 sts (these will all be worked across the top of the fan). Skip the ch-1 space of previous row, sc in dc of previous row, skip ch-1 space of previous row. *Work 13 hdc across the top of the next fan (one per st and space), skip the ch-1 space of previous row, sc in dc of previous row, skip ch-1 space of previous row. * Continue working * to * until the center fans, at which point you will work 27 hdc (one per st and space, including the center space between fans), skip ch-1 sp, sc in dc of previous row, skip ch-1 space. Start working * to * until the end of the row, ending with 13 hdc worked into the sts and spaces of the last fan. Finish off. I’m a stay at home mother to a three year-old and two black labs. I have been designing for almost 2 years and am really enjoying the whole process. I hope to continue designing for many years to come! This is just beautiful! Do please keep designing! Thank you for the pattern! Thank you for the artful design and free pattern! 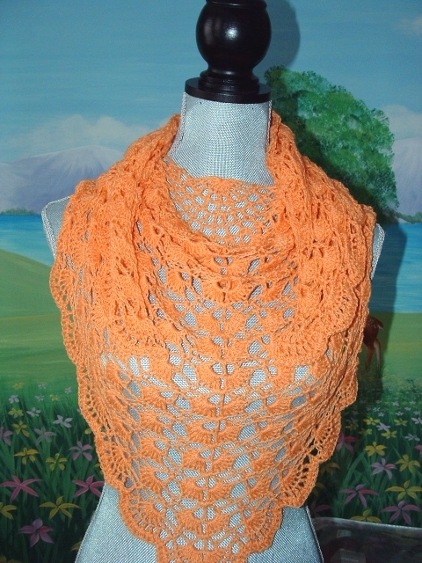 love this shawl and wanted to let you know that i’m featuring it on my blog on february 23, 2012! Thanks so much for this lovely pattern! I will try this very soon! Keep designing! This is a beautiful shawl. It would be perfect for the mother of the bride. I will be the maid of honor at my best friend’s wedding in May. I’m going to make this for her mother and surprise them both. Thanks for the idea. Cheri, this shawl is what I have been looking for. Thank you so much for sharing this. You are very pretty and young! I wish I was as good at designing as you are. =) The best of luck to you, in all that you do. 1. Does the chain at beg of row count as stitch? So that when it says “in the last stitch” you are going into chain? 2. In row 12, I’m confused about where to put “(V-st, ch 2, dc in same space) between the center dc’s on center fans.”. Do do that in between the fans or do that into both of the middle fans. Beautiful pattern. Thanks for sharing. This is a lovely shawl. I am just learning to crochet and would very much like to make this. I’m anxious to share this with a friend. Thank you for the free pattern. I love it. I would like to see more of your designs. Do you have any blanket designs for babies? I’ve bookmarked this page of yours as I really like this shawl and it would be such a useful thing to have. So when I’ve finished my present knitting I’ll be back to make this…thank you!! I bow down to you! You are a crochet Goddess. I am so in love with this shawl. Am going to try to make it tonight. Just hope my lefthanded brain can follow the pattern. Thank you so much for sharing and please keep sharing your beautiful work. How awesome, I have been looking for a shawl pattern for my daughter(age9) for a wedding she is in. I didn’t want her to look to old or too young. This is the perfect design. I will be using Vanna’s Glamour in Diamond to match her sister (made a delicate capulet). Keep on making beautiful things. 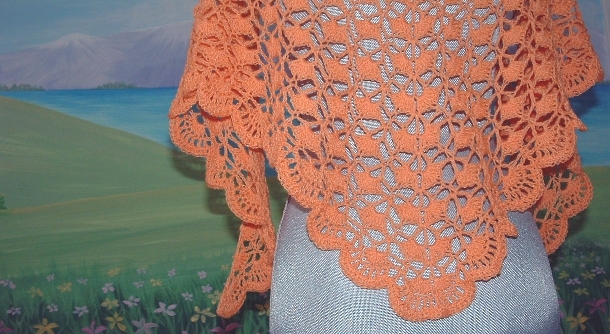 Hi Cheri, I love your Morpho Shawlette, can we talk about my store selling the pattern? I don’t know how you would be able to sell a free pattern in your store. Melissa has the rights to the pattern, so you would have to talk to her about it. Actually, that’s not correct: the pattern will remain available here for free indefinitely, but designers retain rights to their patterns. Designers are welcome to sell patterns they have contributed. Although I doubt selling the exact same pattern would do well, I’ve seen designers from other publications offer variations of their free pattern for purchase and they seemed to do all right. I love your pattern. I just completed this shawlette. It is truly lovely. I am on my way to making a second one. It took me 5 times crocheting row 9-12 before I understood the meaning, but now I got it! I think it should be more clear if you write some more sentences about where you have to crochet the different stitches in the center. It was really hard to understand! It even maybe would be better to write this in row 9: ‘work 7 dc into V-stitch’ instead of ‘next ch-2 space’. You could think it is the ch-2 space you made just before the V-stitch. But I think it will be a nice shawl. My garn is quite different from yours so it’s a very different shawl. I love the look of your shawl but before I start( I have some very gorgeous hand-dyed sock yarn) are the instructions in American or English terms for stitches? I learnt with English terminology ans spend forever translating patters. It isn’t a problem I just like to know before I snuggle down to with my yarn and hook. Thanks for sharing your ideas and pattern. Hello Maureen. We only publish patterns using US pattern notation. Hope this helps! Obrigada por sua generosidade de publicar a receita. Parabéns pelo trabalho. I love your shawl. Thanks for sharing. 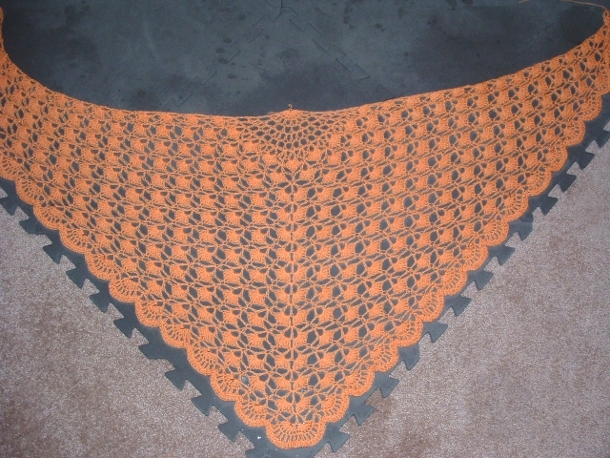 I am going to make one for my in law but I don’t know how to follow instructions, by any chance do you have the graphic, or another picture that is closer so I can follow directly from the shawl. I love this shawl! I made this a few months ago for my mom for her birthday. 🙂 It came out beautiful! Thank you so much for sharing your pattern. Made one of these- turned out gorgeous! Thanks for sharing! Row 2- does the ch4 count as a double crochet? Row 4- so do I skip the initial dc in that row and work into the next ch2? Every time I try this row I come up with the wrong number of stitches so in not sure what’s going on here. Row 6- is “same stitch” meant to refer to the base of the chain? Wow so accomplished for one so young! Beautiful shawl. Thank you for making the pattern available free of charge! I am taking lessons on lace knitting on Crafty. I can do crochet already 🙂 Learned like 40 years ago!